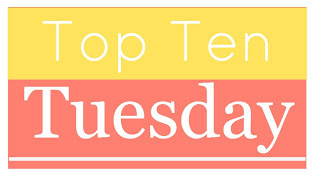 Top Ten Tuesday: Top Ten All Time Favorite Books from the Last 3 Years! This week’s top ten are the Top Ten Favorite Books from the Last 3 Years. 1. Snow Like Ashes by Sara Raasch – I LOVED this book so much that I declared it my favorite 2014 read. I love the characters in this book and the world Sara created. 2. Under the Never Sky by Veronica Rossi – This series for me will be a forever re-read series. I’ve already read it multiple times and I know I’ll come back. This series is AMAZING because of the CHARACTERS! More than any book, I wish these characters were real people. 3. Divergent by Veronica Roth – Now, first off…as a series, I really hate this series…BUT I LOVE Divergent! I’m still bitter about this series as a whole but I can’t deny my love for the first book. 4. Scarlet by A.C. Gaughen – I ALMOST DNF’d this book! Ah! I’m so glad I didn’t because this book is truly amazing. Very swoon-worthy and awesome characters. 5. Crown of Midnight by Sarah J. Maas – I love the Throne of Glass series but, so far, Crown of Midnight is my favorite. 6. Falling Kingdoms by Morgan Rhodes – This fantasy series is amazing! I love it when I got back and forth between loving and hating characters. It really keeps me guessing and I never know what’s gong to happen. 7. Eternity Cure (The Immortal Rules Series #2) by Julie Kagawa – I don’t cry very easily with books but oh man…did I cry. This book tore out my heart, thanks Julie Kagawa! This is a great series, so read it if you haven’t! 8. The Iron Queen (The Iron Fey series #3) by Julie Kagawa – Here is another book that riped my heart out, in a good way! This is such a wonderful series full of good and evil battling it out and a sarcastic cat! 9. Grave Mercy by Robin LaFevers – I just read this book a few weeks ago and it really is a must read! The world is so interesting and the romance in this book is one of my favorites. 10. Bitter Kingdom by Rae Carson – I LOVE THIS SERIES! Be warned though…I didn’t care for book 1, The Girl of Fire and Thorns, BUT each book in this series gets more and more amazing. This by far has been my favorite series enders! Your blog design is amazing, by the way! Check out my TTT and my Last List Blog Hop Review and Giveaway. I'm so NOT sure I'd even be able to choose just ten ALL time favourites! I must check Scarlet and Falling Kingdoms, they're in my wish list, and since they're in your ALL time faves, I ought to move them to the TBR pile! Thanks for commenting! All these books and series are fabulous! Scarlet & Grave Mercy are both must read books. Like, you're life is incomplete if you don't read them. 🙂 Thanks for stopping by! Scarlet is super swoony and awesome. Love this list! Crown of Midnight also made my list (my favourite of the series so far!). I absolutely LOVED Rae Carson's A Girl of Fire and Thorn series – it really surprised me how much I enjoyed it. I really need to read Snow Like Ashes and Grave Mercy asap; heard amazing things about them! I loved Scarlet and just read it recently too! I have Lady Thief to begin soon. I also have Grave Mercy and must read it! Of course, The Bitter Kingdom is amazing! I should have just included the whole trilogy for my list…so difficult to narrow it down! I haven't read Crown of Midnight yet. I've only read the first book in the series, and I wasn't that impressed… but quite a few people have said that the series doesn't really hit its stride until that second book. So I'm willing to give it a try! I see you have Grave Mercy on your list, too. I've seen it on other lists today, as well. It's in my TBR pile! Yes this was very hard. 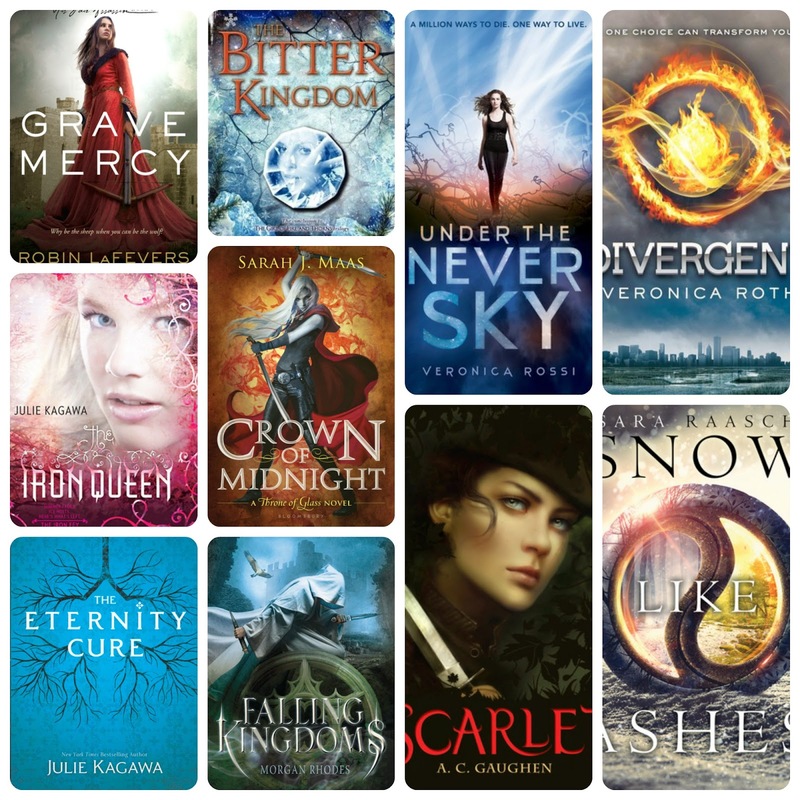 I tried to include books that gave me tons of feels. Grave Mercy really is amazing!!! Thank you!!! Falling Kingdoms is fantastic, I definitely recommend reading it soon! Crown of Midnight really opens up what's really happening in the world and I enj it even more the second time around. Scarlet is incredible, tons of feels!